03.21.2015, B2B social media, by Eric Brandt. There are specific challenges to those seeking to tweet to B2B audiences — how to hit the sweet spot that interests those networks you want to penetrate. How to craft your messages so they don’t sound like crude sales or wooden boilerplate. How do you avoid dull broadcasting? 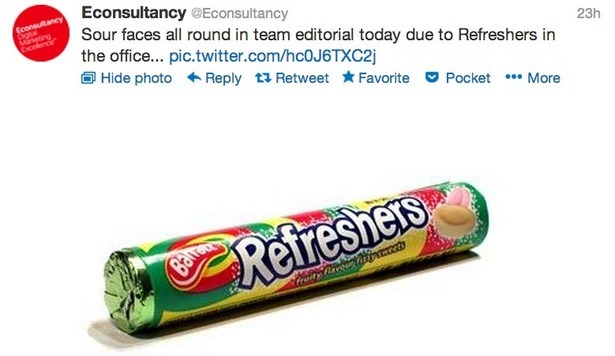 David Moth shared six shining examples on the Econsultancy blog. HubSpot has attracted a whopping 284,200 followers, which is an impressive figure for a marketing software firm. The main reason for its success is the massive amount of content it produces, ranging from blog posts to white papers, so digital marketing folk see HubSpot as a valuable source of information. But it also gives its social media team freedom to tweet random questions and engage in conversations with people, giving the feed an injection of personality rather than just being a one-way marketing tool. Yesterday it gave over control of the feed to CEO Brian Halligan, which is a good way of giving customers access to the person at the top of the organisation and again makes the feed different to the usual corporate social account. One of the things I’m not so keen on is the fairly frequent retweets of compliments from other users, which may be a good way of gaining social proof for its products but personally I find it a bit self-congratulatory. General Electric’s main feed has just over 125,000 followers and focuses on technology and innovation rather than just pushing out sales messages, turning what could easily be a dull, corporate Facebook page into something genuinely interesting. Also, the social team do a good job of responding to other users and recently rewarded people who complimented the brand’s new Agent Smith advert by sending them a Matrix-style photo of their avatar. 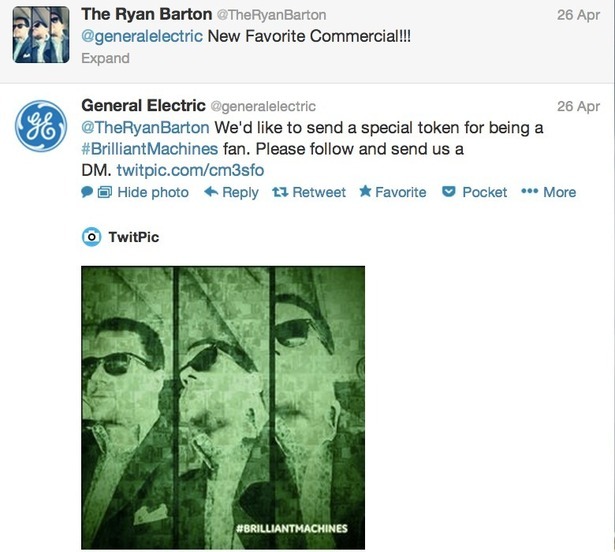 And obviously a company with GE’s expertise in social has also produced other noteworthy campaigns. For example, on national inventors’ day in February it invited users to tweet their invention ideas using the #IWantToInvent hashtag then had a team of designers standing by to create blueprint sketches of the tweeted inventions in real time. It produced more than 70 images in under seven hours, including solar powered wings and a doorbell ID, which can all be viewed in a Facebook photo album. 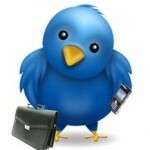 The campaign was supported with promoted tweets in timelines and search targeted to users interested in science and technology. 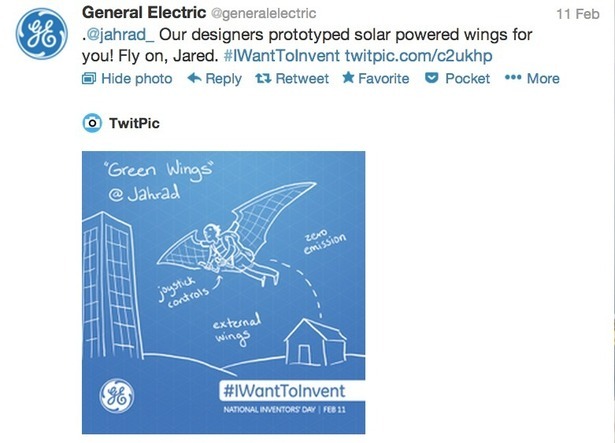 According to Twitter, #IWantToInvent took a month to plan and increased brand conversations over 4x the daily average. GE has also been a prolific user of Vine, creating more than 20 clips in the past few months. A number of the Vine’s use stop motion, including this excellent clip that celebrates Pi Day – it’s an endless pie. Adobe’s Twitter feed remains incredibly focused on its own products and company news, with nearly every tweet managing to crowbar in a brand mention, no matter how tenuous the link. For example, it took advantage of Earth Day to tout the company’s own green credentials. However, it also manages to avoid being tedious by tweeting a broad range of content, such as promotions, live updates from events, company news, and links to its other social platforms and forums. Furthermore, the social team do a good job of responding to other users, answering product queries or questions about the website and engaging in general conversation. And like General Electric, Adobe has been quick to begin experimenting with Vine to share content from its various events, including this clip of The Black Keys. As a result it’s managed to attract 168,148 followers. Intel has an interesting, entertaining Twitter feed that shares a mix of company information, competitions, jokes, memes, articles and quotes. Even so, I’m quite surprised that it’s managed to attract more than 1.3 million followers. The social team very rarely respond to other users and the feed is mainly used as a broadcast tool, which rather undermines its social credentials. So regardless of how entertaining it is I think it’s a case of the brand name attracting the followers rather than the content. That said, it’s still a good example of how to bring some personality to a B2B Twitter feed and 1.3 million followers is not to be sniffed at. Dell is well known for being brave with its social strategy, which is evidenced by the huge number of popular B2B Twitter feeds it operates. Some of them simply deal with company news and announcements, but others are dedicated to answering customer service queries. For example, there’s Dell Cares PRO which provides 24×7 global support and Dell for Business which answers questions from small and medium size businesses. The different feeds also communicate with one another to make sure that customer queries are dealt with through the correct channel. Providing round-the-clock support is no mean feat and obviously requires a great deal of commitment and investment in social throughout the business’ hierarchy. To make sure it stays on top of things Dell has a social media command centre that aggregates customer conversations around the web, allowing the company to identify issues, address complaints, gather feedback on products, and quickly react to customer needs. Obviously a vast majority of B2B companies are nowhere near having this type of capability and are unlikely to get near it any time soon, but it’s definitely a god model to aim for. It might seem breathtakingly arrogant to include ourselves on this list, but we’ve previously made an infographic shouting about how good we are so why stop now? Through the hard work of Econsultancy head of social Matt Owen we’ve managed to clock up more than 130,000 followers and Twitter is now one of our main sources of traffic. As well as automatically tweeting out our blog posts Matt uses Twitter to monitor conversations about the brand, deal with queries, ask questions about relevant topics, promote our reports and events, and talk about what’s going on in the Econsultancy office. Ultimately the idea is to use Twitter to both promote our products and interact with our subscribers and other digital marketing folk, which helps to build the brand and raise our profile. Between 2009 and 2012 our revenue from Twitter increased by 4,091%, albeit from a low base, which shows that we’ve certainly been effective in using Twitter for B2B marketing. Plus Obama and MC Hammer follow us, which is a ringing endorsement in anyone’s book.